This year was the 40th edition of Dutch festival Pinkpop. 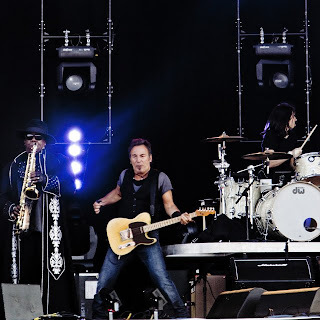 And of course this called for a celebration so organizer and Mr Pinkpop Jan Smeets was able to book no one else than The Boss himself as the headliner of the first day of the three day festival. Since festivals are costly these days we only got ourselves tickets to that first day and this turned out to be a good choice. But first we had to face the traffic gods that turned against us and we ended up in heavy traffic jams because of accidents, cars on fire and fully choked access roads to the festival. Unfortunately we couldn't make it to the festival in time and had to miss the first bands. When we finally made it Chris Cornell was already halfway his set and just finished one of my favourite songs "Hunger Strike". But the nice weather and my old friend Mr Beer made me feel happy within no time. One good thing we came in late was that we didn't have to make it through songs of Chris' latest album once more. It was a good choice of him to mix new and old songs into his set. Once he started playing songs like "Spoonman", "Cochise" and "Black Hole Sun" things seemed ok. So he experimented with Timbalake and it failed. So maybe the Soundgarden days and grunge are outdated. He's still one of the best rock singers out there even though he cannot sing as high as he used to. I'm sure he will come back with a killer album next time. In the meantime I'll settle for the old stuff. Mix songs by artists like Elton John and The Beach Boys with punk and this is what you get: a crazy bunch of musicians in cheesy outfits having the time of their lives. It still feels like a gimmick and gets a bit boring in the end. Of course it's all a bit of a joke to the musicians who are also playing in bands like NOFX and Foo Fighters. But they seem to enjoy it a lot and so do most of the people. I read so many good things about this band however their album "The Seldom Seen Kid" just isn't my cup of tea. I saw a bit of their show last year on the Lowlands festival and wasn't too impressed. So what's everyone raving about? Here was my chance to find out again and I still don't get it. I guess I'm just not really into it. However their songs are decent and their performance solid as a rock. I really like their first album "Hot Fuss" but the later albums not so much. Too much Vegas style I guess and so were their shows. But they've grown over the years and they played a very good set. It proved to me once more though that the songs of the first album are just better than the rest. Songs like "Mr. Brightside", "Somebody Told Me" and "All These Things That I've Done" just seem to rock more. Singer Brandon Flowers was all smiles throughout the whole set maybe because his big example Bruce Springsteen was watching and seemed to approve? Of course it's nice to book a big name like this. Tickets to the first day sold out in no time and it will generate lots of publicity. However it will drain your budget and minimize the other bands to support acts. And the big headlines might live up to the expectations. But not to worry this time. Bruce's performance was legendary and will be remembered long after. The band sounded tight and solid and Bruce was exactly what you would expect: charismatic, lively, all over the stage, striking his characteristic poses while the sun was setting. Every camera shot on the big screens seemed to be magical. He played new and old songs in a well-balanced set and even found a Dutch Courteney Cox to dance with him during "Dancing in the Dark". The Killers singer Brandon Flowers joined him to sing "Thunder Road" and was as happy as a kid with its Christmas presents and didn't seem to believe he was actually standing there with his big idol. I was glad to be part of this almost three hour performance. Jan Smeets couldn't have made a better choice for the perfect anniversary gift.